WASHINGTON/ISLAMABAD: The United States has suspended nearly all security aid to Pakistan, the Trump administration announced on Thursday, in a sign of its frustration with the country’s refusal to “do more” against terrorist networks. The suspension includes Coalition Support Funds (CSF) for Pakistan, which is provided by the Pentagon to help pay the costs of Pakistan’s counterterror operations. Pakistan insists that there are no facilitators of terrorist groups on its soil, and reiterates stance on the US’s repetitive demand for the country to “do more”. 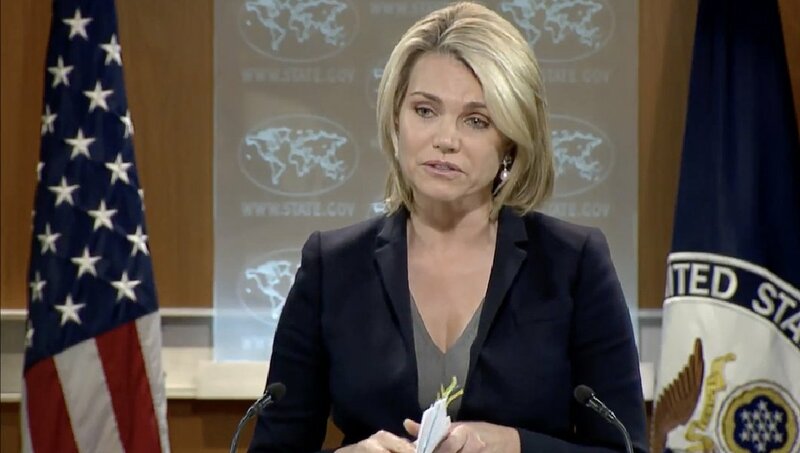 “Today we can confirm that we are suspending security assistance only to Pakistan at this time,” State Department spokeswoman Heather Nauert said at a press briefing. The State Department official added that Pakistan could receive the suspended funding if it takes decisive actions against terrorism. “The suspension is a freeze, and does not reflect intent to reprogram funds at this time,” The New York Times reported citing internal government talking points. Heather Nauert did not provide an estimate of the total aid funds affected, but said it would be a very significant figure. The announcement to suspend military assistance to Islamabad has come after Washington accused Pakistan of playing a “double game” on fighting terrorism and warned Islamabad it would have to do more if it wanted to maintain US aid. The Trump administration had delayed $255 million in State Department aid. The United States has provided Pakistan more than $33 billion in aid since 2002. US Ambassador to the United Nations Nikki Haley said Tuesday that Washington would withhold $255 million in assistance to Pakistan. US President Trump began his new year by accusing Pakistan of giving Washington “nothing but lies and deceit”, announcing that the country will not get any aid in future. President Trump tweeted that Islamabad thinks of US leaders “as fools”. He said Washington had “foolishly given Pakistan more than $33 billion in aid over the last 15 years”. In turn, he claimed that Pakistan had given “safe haven to the terrorists we hunt in Afghanistan, with little help”. “No more,” he added, in what seems to be the latest iteration of Washington’s “do more” mantra. Pakistan responded to Trump’s intimidating tweet with one voice, as it lodged a strong protest by summoning US Ambassador David Hale to the Ministry of Foreign Affairs and serving him a demarche over the US president’s tweet. “David Hale was informed that all the state institutions stood united over Trump’s threats. The envoy was informed that there was no truth in the allegations levelled by the US president. The envoy was also told that there was no truth in US president’s assertion about US aid to Pakistan and that Pakistan had taken all these allegations seriously,” well-placed sources had informed Pakistan Today. Foreign Minister Khawaja Asif said the United States was shifting its frustration towards Pakistan after its failure in Afghanistan. “Pakistan is fully committed to safeguard its territory,” he added. Unfortunately, Asif said, the US had given Pakistan nothing but invective and mistrust. “US forces based in Afghanistan also overlooked safe havens of the banned Tehreek-e-Taliban Pakistan (TTP) which has killed thousands of Pakistanis,” he added. The US president’s latest tweet follows in the aftermath of an increasingly tense back-and-forth between Washington and Islamabad after Trump announced the administration’s latest national security strategy. During the announcement, the US president was quick to remind Pakistan of its obligation towards helping America because it receives “massive payments” from Washington every year. “We have made clear to Pakistan that while we desire continued partnership, we must see decisive action against terrorist groups operating on their territory. And we make massive payments every year to Pakistan. They have to help,” the US president said. Responding to President Trump’s assertion about US funding to Pakistan, Gen Asif Ghafoor had asserted last week that the aid Pakistan received from the US was “reimbursement for the support we gave to the coalition for its fight against Al Qaeda. Had we not supported the US and Afghanistan, they would never have been able to defeat Al Qaeda”. The military spokesman had insisted that there are no facilitators of terrorist groups in Pakistan, reiterating Islamabad’s stance on the US’s repetitive demand for the country to “do more”. “The armed forces are working with friends and want to continue doing so, but there can be no compromise on our national honour. We do not want a conflict with our friends, but will ensure the security of Pakistan,” Maj Gen Ghafoor said in what is perhaps the strongest-ever reaction from Islamabad since US functionaries and statements recently began alluding to the possibility of unilateral action, amidst an ongoing row over alleged terrorist sanctuaries. Commenting on blaming Pakistan for inaction against the Haqqani network, Ghafoor had said: “Blame for inaction against [the] Haqqani network might have been relevant owing to our capacity issues till Zarb-e-Azb”. He further said that if there any facilitators or abettors inside Pakistan that can only be addressed if 2.7 million Afghan refugees are sent back to Afghanistan for which pull factors needed to be created by Kabul and Washington. Jihad karo chutiyo. That’s what you kattus are fit for. H1B visa decision won’t hurt our economy in any significant way, as India transforms from a services based economy to a manufacturing based economy. Our Nikkei manufacturing pmi has registered a 7 year high growth at nearly 55, this quarter. However it is nice to see Pakistan getting f*cked left right and center hahahahahaha. Expect economic sanction next time. You were eating grass all these years now you will eat mud and your own sh*t.
hahahahhaa good joke sh*t hole pakistan with 90% people starving without food water electricity should concentrate on improving its f*king gutter hole an economy. India is set to surpass france and Uk GDP to become world’s fifth largest GDP this yesr. So take chill pill beggar. And also do some thing about your polio problem. No country issues visa to pakistanis because of a fear of polio out break. Worthless third world abomination of a country still begging for aid and food, even almost 80 years after the independence. Learn something from bangladesh beggars. This is the best thing which has happened to Pakistan. It is time to stand on our feet and face the adversity as it may be. The late President Ayub was right when he said we need friends not masters. International relations are never static but always dynamic. We will be still friends of US but will still disagree. No nation can be an island! Yes, the United States did a lot for us, CSF mean’t a lot for Pakistan, but at the same time we suffered most at the hands of terrorists. USA is now inclining towards India and this is why we are playing double game. I would advise Readers not to comment in this paper as it is too committed to sycophancy. Will never post any hostile to US comment.